DeepSee automatically creates a measure whose default name is Count. To override this default name, specify the Count measure caption option for the cube; see Specifying Cube Options, earlier in this book. To add a measure, drag a class property from the Class Viewer and drop it onto the Measures label in the Model Viewer. Then make changes if needed in the Details Area. Select the measure in the Model Viewer. Property or Expression  Specifies the source values. See Defining the Source Values for a Dimension or Level and Details for Source Expressions, earlier in this book. number (this is the default) Numeric data %Double Numeric value. Default aggregation is SUM. integer Numeric data (any fractional values are removed by truncation) %Integer Integer value. Default aggregation is SUM. age Date/time data in $Horolog format %Integer Age value in days. Can be used only with AVG (default), MIN, and MAX aggregations. Age measures are not generally recommended, unless you perform nightly rebuilds. date Date/time data in $Horolog format %DeepSee.Datatype.dateTime Date value (in $Horolog format, with seconds removed). Can be used only with AVG, MIN, and MAX (default) aggregations. boolean 0 or 1 %Boolean Boolean value that can be aggregated. Default aggregation is COUNT. string Any %String String values to be stored in the fact table; these are not indexed. Can be used only with COUNT. This measure cannot be dragged and dropped in the Analyzer. text Any %Text String values to be stored in the fact table; these are indexed. This measure cannot be dragged and dropped in the Analyzer. iKnow* Text values %GlobalCharacterStream or %String, depending on the selected source Text values to be processed and indexed using the iKnow Smart Indexing API. This measure cannot be dragged and dropped in the Analyzer. *For information on the iKnow type, see the Advanced DeepSee Modeling Guide. SUM (the default)  Adds the values in the set. COUNT  Counts the records for which the source data has a non-null (and nonzero) value. MAX  Uses the largest value in the set. MIN  Uses the smallest value in the set. AVG  Calculates the average value for the set. For a boolean or a string measure, select COUNT. You can specify that a measure is searchable; if so, you can filter records used in a pivot table by the value of that measure. To specify a measure as searchable, select the Searchable check box in the Details Area. A searchable measure cannot include square brackets or commas (,) in its name. For date measures, see the next section. 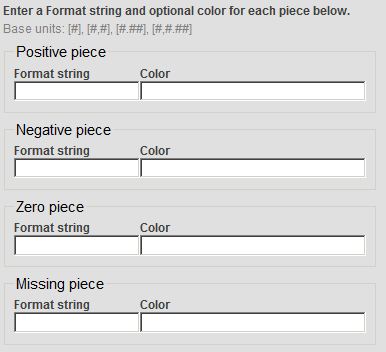 Missing piece specifies the format to use for missing values; this is not currently used. The details are different for date-type measures; see the next section. Note that Caché displays the thousands separator and the decimal separator as determined by the server locale (see Using the Locale to Control the Names of Time Members, earlier in this book). The locale, however, does not affect the syntax shown in the first column of the preceding table. Date uses the default date format for the current process. Where color is a color as described in Color Piece, in the previous section. Date uses the default date format for the current process and also is displayed in the given color. Date is displayed in the given color. This affects the list immediately. You can then reorganize the list further if needed. Also, when you add measures, they are not automatically alphabetized. Click the name of a measure and then click the up or down arrow as needed. Repeat as needed for other measures. The order of the measures in the cube affects how they are displayed in the Analyzer. It does not have any other effect. Some customers choose to alphabetize their measures for convenience; others put more-often used measures at the top of the list. By default, DeepSee generates the names of the columns in the fact table, but you can specify the column names to use instead. 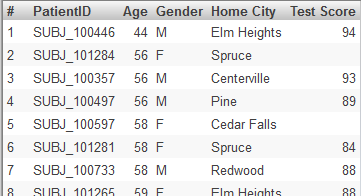 To do so, specify a value for the Field name in fact table option for each measure. This option is not available for iKnow measures. Take care to use unique names. By default, when a user displays a detail listing, DeepSee displays one row for each source record that is used in the current context (that is, the context in which the listing was requested). For a given measure, you can specify an additional filter for DeepSee to use when displaying the detail listing. For example, consider the Avg Test Score measure in the Patients sample. This measure is based on the TestScore property, which is null for some patients. You could redefine this measure to filter out those patients, when the user starts on the Avg Test Score measure and then displays a listing. This filter is added to the detail listing query and removes any records that do not meet the filter criteria. The other form of listing filter is MAX/MIN. If you use such a listing filter, the detail listing shows only the records that have the maximum (or minimum) value of the measure. The measure must use the same kind of aggregation as does the listing filter (if a listing filter is included). If you intend to use MAX for the listing filter, select a measure that is defined with Aggregate as MAX. Similarly, if you intend to use MIN, select a measure that is defined with Aggregate as MIN. When you use this option, the Architect automatically enables the Searchable check box, because this measure must be searchable.